Is it really the end of March already?! I can't believe it. I've been back blogging for about four months already! Today I've got a bunch of things I've been loving and using this month. There's a right old mixture here! I've been loving printed, patterned shoes. Just any kind of shoe that's a bit different, really. These leopard print flats from Topshop are a perfect example of that. I've also got my eyes on some pointed silvery metallic flats from Topshop that I might have to purchase. I've also rediscovered my MAC Studio Fix Powder. I found it abandoned in an old handbag after looking for it everywhere and it's just a classic that I keep going back to. This pink Beauty Blender has changed my life, seriously. Before, I just used to use a stippling brush to apply my foundation, but with a beauty blender the game has changed completely. My foundation looks airbrushed and amazing and if you haven't tried one I recommend you order one, stat. No, my phone isn't in my monthly favourites, it's actually Spotify. I'm new to this whole Spotify thing, I didn't understand the hype and have stuck with my temperamental iTunes Music app. Oh my, do I now understand the hype. This bad boy has everything! I can make playlists, listen to other playlists, and it's all organised so easily! I do love a well organised app, and combining it with music? Obsessed. At the top there is a teeny tiny highlight that magically transforms me from normal 19-year old to a magical natural fairy/goddess. This is the Topshop Chameleon Highlighter in Mother Of Pearl. It contains Chameleon Pearls (no idea what that is but it sounds uber cool), and is perfect for strobing. And considering it's about £10 cheaper than the high-end highlighters, this is just as pigmented and pretty. I actually reach for it more often than my Beverly Hills Illuminator, I'll admit. So, for myself, this has been a beauty staple for a while now. The classic St. Tropez Self Tan. It gives me a gorgeous, buildable tan immediately, and it lasts for days and days. If you don't get it wet after the first 4-ish hours of applying, then it won't run and it even lasts me nights out (and we all know we can't survive a night out with a drink being spilt down us). The Gwen Stefani X Urban Decay blush palette is everything. I've been wearing it most days for about two months now and I love experimenting with it...there are SO MANY COLOURS. 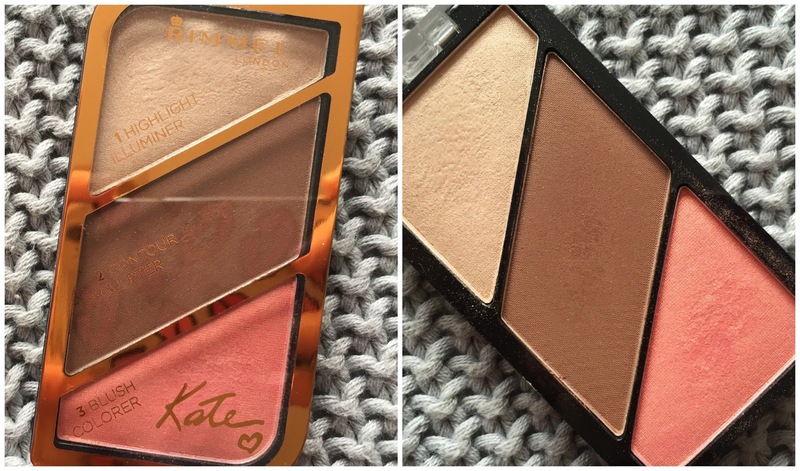 If you're a blush/bronzer fan, you need to get your hands on it. I wrote about it in more depth here if you're considering purchasing it. Lastly is my Monica Vinader bracelet. I love love love this. I got it for my birthday and I've worn it nearly every day. It's so small and delicate and simple, it doesn't get in the way if you're typing or writing or doing general daily tasks. I love the clasp and how it looks when it's on, and I feel like wearing two at once would look gorgeous if they were different colours (come at me with the rose gold). It's gorgeous! And you'd love the highlighter, it's perfect for paler skin too because it's a peachy colour! I absolutely love those leopard print shoes, Topshop always have the quirkiest of shoes! I agree, you can always count on Topshop to find some shoes that are a little bit different! Thank you! I loveeeee it. great picks! you gotta love a beauty blender! Can't go wrong with a beauty blending sponge it really is a good piece of kit! Still am a Mac virgin but hoping to change that along with a lot of other things! I know right! Yeah you definitely need to make your first Mac purchase soon you won't regret it!